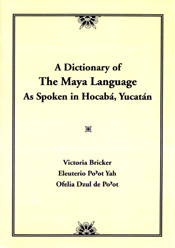 The Maya language of Yucatan is known as Yucate by linguists, but its speakers refer to it as May. Dialiectical differences are minimal across the peninsula, and the more than 750,000 speakers of Maya can be understood wherever they go. Moreover, it is not only a living language but is of great use to epigraphers working on ancient Maya glyphs. This dictionary is the culmination of fourteen years’ labor centering on the town and dialect of Hocaba. Whereas other dictionaries of may use Latin paradigms, this is the first to provide a comprehensive, systematic listing of the stems that can be derived from each root and that give Maya its distinctive character. The entries cover the full range of Maya speech, from simple expressions and idioms to compound stems. Maya sample sentences provide a window into the richness of everyday communication, with its mixture of wit, epithets, insults, riddles, aphorisms, and exchanges of information, including a wonderful assortment of metaphorical expressions like "peccary’s eyelashes" for a type of bean, "the end of the road" for marriage, and a verb meaning "to draw breath with puckered mouth after eating chili." Among the cultural domains encompassed by the dictionary are agriculture, architecture, astronomy, culinary practices and recipes, education, folklore, games, humor, medical prescriptions, ritual, toys, and weaving, many of which have roots in the Precolumbian past. In addition to the dictionary entries, this work also contains a short grammar, a botanical index, and bibliography. Victoria Bricker is professor of anthropology at Tulane University. Eleuterioi Po’Ot Yah was born in Hocaba and now teaches Maya at the Academia de la Lengua Maya in Merida. The late Ofelia Dzul De Po’Ot was a native of Hocaba.